The Cathode Ray Tube site. Geissler tubes. Heinrich Geissler was a skilled glassblower from a glass art making family in Thuringen Germany and worked as a travelling instrument maker in Germany and the Netherlands. 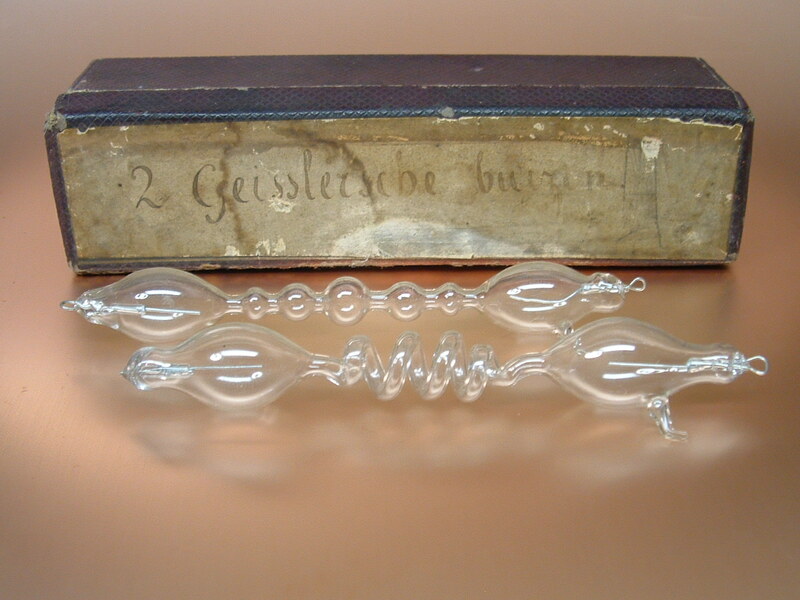 Geissler opened a small company in Bonn in 1852 to sell his self made scientific glass instruments to schools and Universities. In that same time he developed a new type of mercury vacuum pump. With this instrument he was able to create an higher vacuum (2 Torr) than possible that time with standard equipment and enabled the production of high vacuum tubes which led to many discoveries of new physics instruments like the different Crookes, Hittorf, Goldstein and X-ray tubes. Geissler experimented with different gasses in vacuum tubes, together with Julius Plücker who worked with him and named them Geissler tubes. 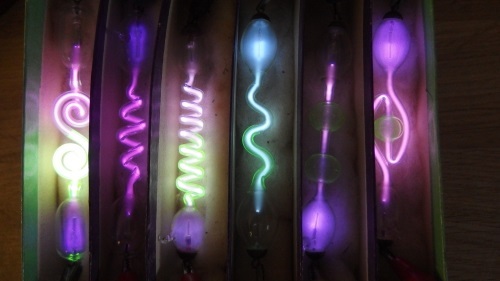 When he applied high tension to the tubes they produced a bright luminous effect which was demonstrated for public in 1864 together with his new mercury vacuum pump. 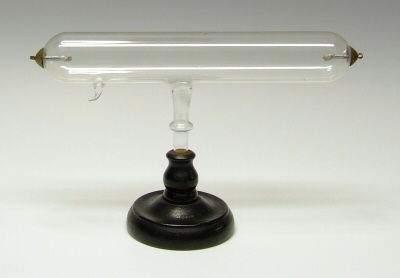 The Geissler tube was the practical development of discharge light. 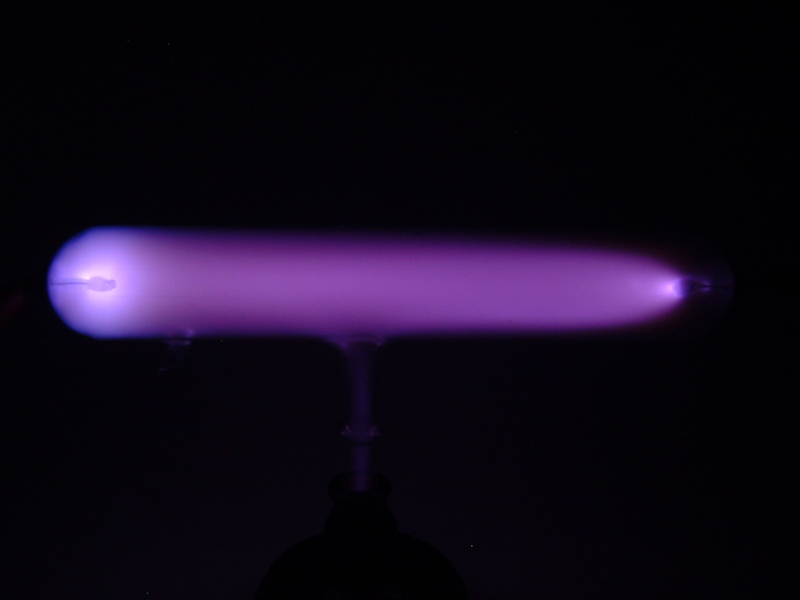 Something that was until then, only possible with instruments like "electric eggs" which had to be pumped near vacuum. 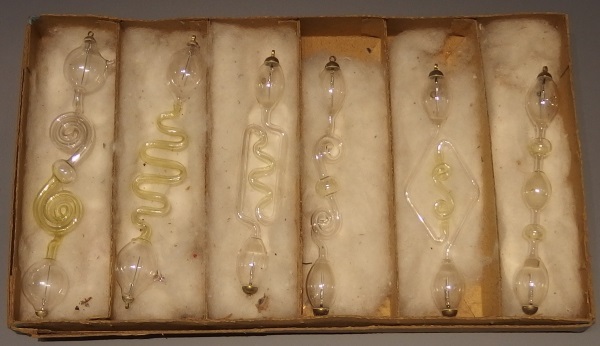 Geissler was able to pump and seal glass tubes so it was much more easy to use. His tubes, where sold for research and demonstrations at Universities, schools and later on even for upperclass home-entertainment use. The glass tubes contain a low vacuum, the remaining gas molecules trapped in the tube together with a high voltage are responsible for the discharge. Geissler solved the "metal electrode through glass problem" (leaks) by using platinum wire in a lead glass seal which was melted into the soft sodalime glasswall of the tube. From the third quarter of the 19th Century until the 1930 Geissler tubes were produced by many glassblowers like Franz Müller, Greiner & Friedrichs, Rudolf Pressler and Richard Müller-Uri. In France and and Britain also many scientific workshops started the production and often used uranium glass, fluorescent liquid and different types of rarified gas to make the most beautiful luminous compositions. 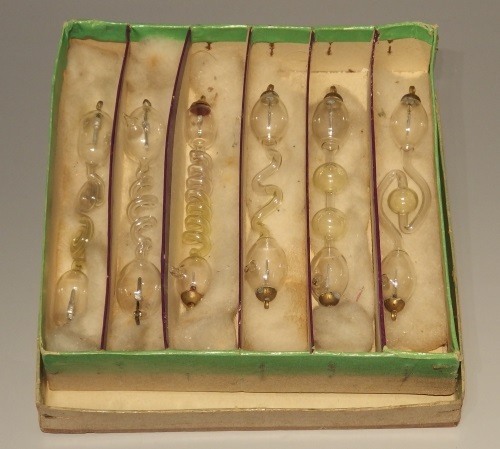 The British Science Museum in London and the Dutch Teylers Museum in Haarlem displays original tubes from Heinrich Geissler. In Thuringen a museum is dedicated to Geissler's work in his hometown. A biography of Heinrich Geissler can be found here. 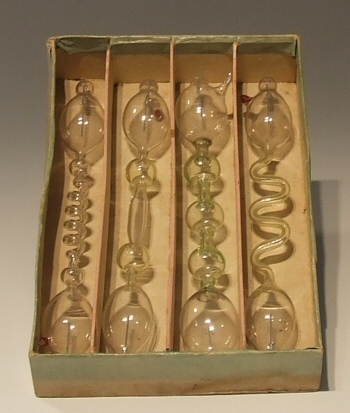 late 1800 containing four 15cm tubes. All tubes are still working. 2 small 10cm early Geissler tubes with original box. Sadly the vacuum is lost due to minor cracks between the sealing and the platinum connection wires. This is a common failure with this old tubes. Two nice 25cm tubes on a stand. 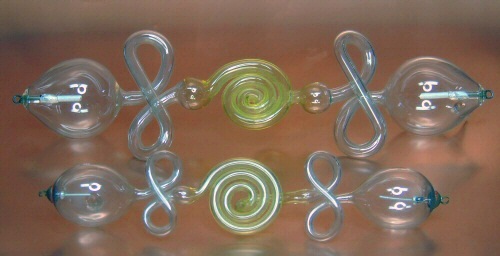 Two double twist with Catherine wheel Geissler tubes. The larger tube has the typical early wire connections in this case probably Dumet wire which came in use after 1911 and replaced the expensive platinum wire. Dumet wire consisted of a 42% nickel -iron alloy coated with a thin layer of copper and is a bit thicker than the old Platinum wire. For more info about Dumet wire look here. 14cm tube with press glass grape in the middle. This tube has stratifications as can be seen on the left side. In the tube there are some white grains probably to restore the correct pressure for this effect. 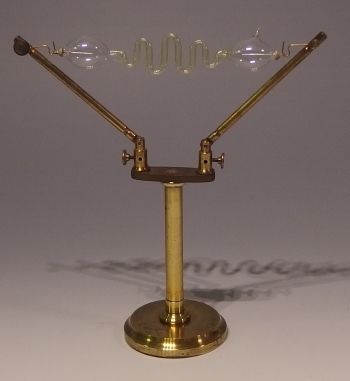 Fine early Geissler tube with uranium glass twist. 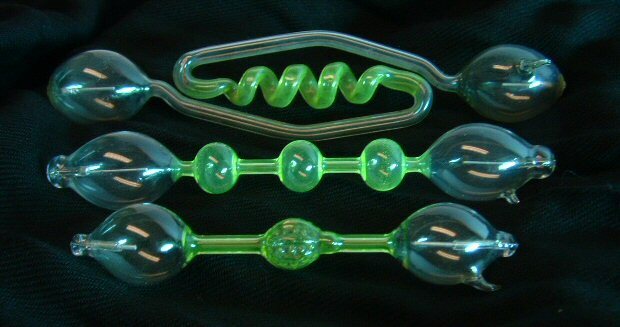 Collection of 3 small Geissler tubes with uranium glass. 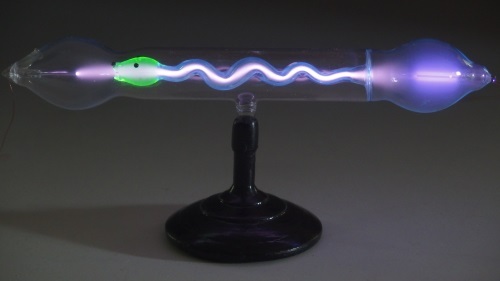 Standing Geissler tube with uranium glass twist. 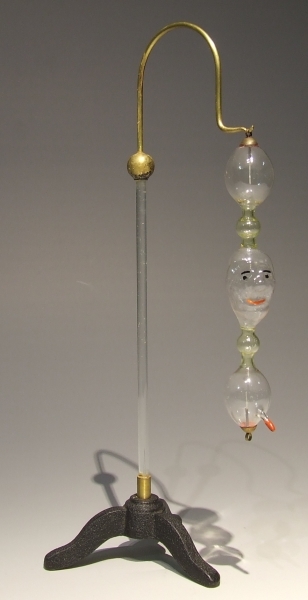 This is an extraordinary and rare 15cm Geissler tube with a face and bold head. Rare 15cm tube with interrupted wobble. 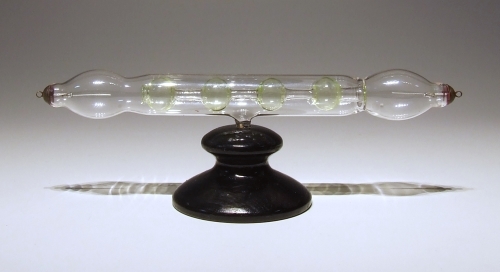 Nice old 20 cm Geissler tube with two uranium glass grapes. 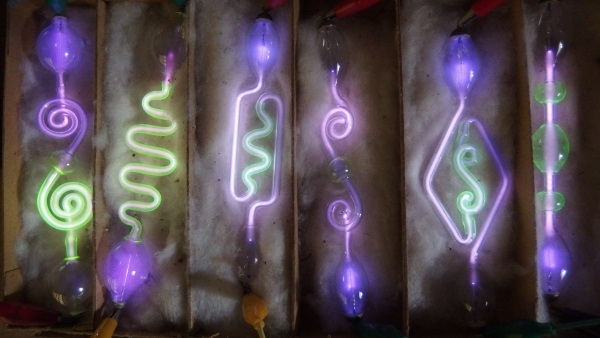 Early small 10cm tube with wire loops The light between the three uranium glass bubbles has a stratification effect. This is a very early example from the late 1800's on a nice black painted wooden stand. 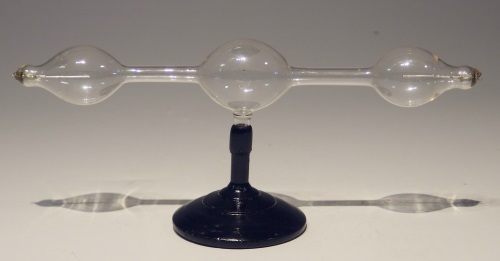 A very nice 25cm late 1800's Geissler tube. 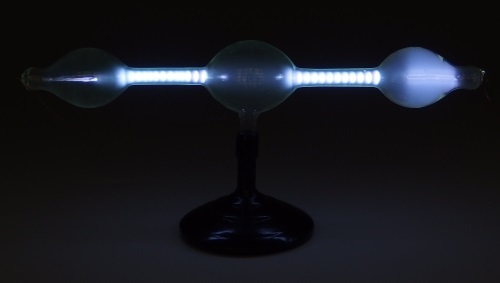 The wobbles of this tube are made from rare blue fluorescent glass. Originally the tube used to have platinum wire connections, the caps are a later addition. 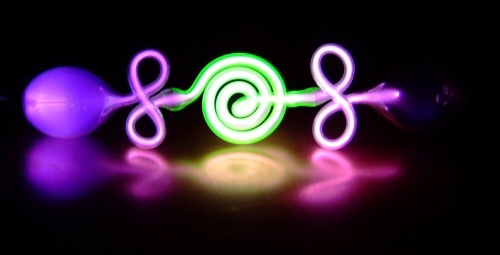 An early 18cm tube with interrupted uranium glass curl. The electrodes are sealed with blue glass, late 1800. Even at its age the vacuum is still perfect! 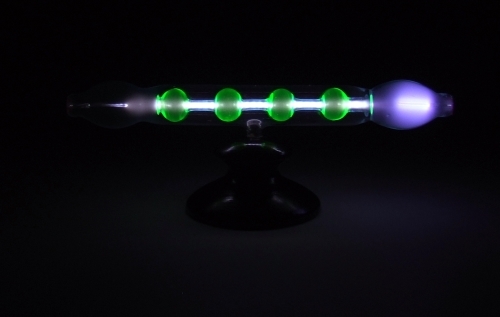 A late 1800's Geissler tube on a stem with rare blue fluorescent glass and uranium glass spheres and stratification discharge. Originally the tube used to have platinum wire connections, the caps are a later addition. 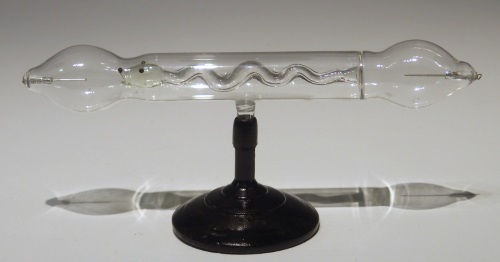 This is a very cute little snake tube, length 15cm. The same tube can be seen in a 1870 French catalogue. 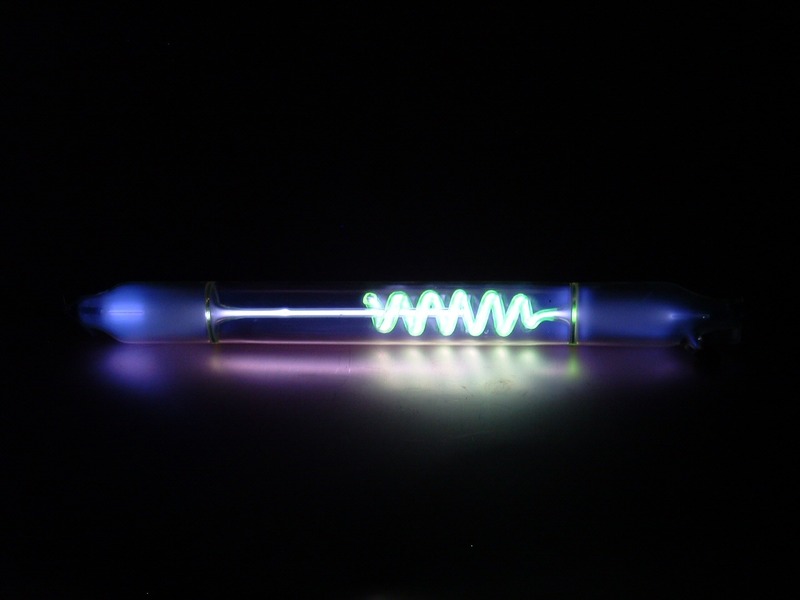 This tube has blue fluorescent glass which is typical for early French tubes. Probably my oldest tube, one of the earliest Geissler tubes printed like the drawing from the physics book of Ganot from 1870. The tube is still working, even the stratification effect which is difficult to photograph. 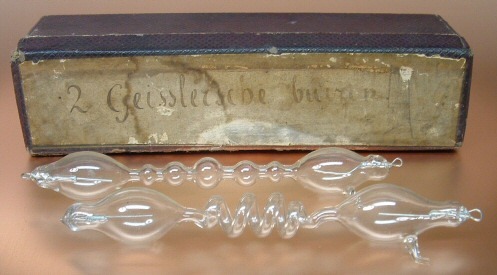 Another early Geissler tube with stratification effect.